Heat oven to 375° F. On a lightly floured surface, unfold the sheet of pastry and roll it into a 10-by-12-inch rectangle. Transfer to a parchment-lined baking sheet. Using the tip of a knife, score a 1-inch border around the pastry without cutting all the way through. Brush the border with the egg and sprinkle with the granulated sugar. Bake until golden and puffed, 18 to 22 minutes. Meanwhile, with an electric mixer, beat the cream cheese until smooth. Add the cream, lemon zest, and 2 tablespoons of the confectioners’ sugar and beat until smooth. Spread the cream cheese mixture evenly within the borders of the pastry. 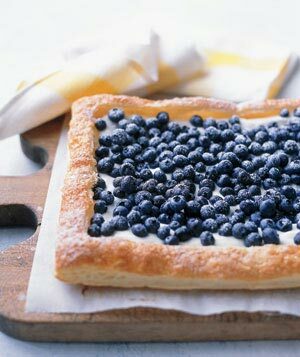 Arrange the blueberries in a single layer over the filling and sprinkle with the remaining tablespoon of confectioners’ sugar.